In this article, we have mentioned only the entry level positions in marketing. Most jobs in marketing start as specialists, indicating the need to specialize in one area of marketing. These are knowledge and skill driven jobs. Overtime if you move into coordinating/managing positions you may also supervise people from other groups in marketing. Typically marketing department has a variety of specialists taking care of various aspects. The compensation is based on the size of the company and nature of industry. They mostly are desk jobs that typically do not require travel. Typically specialists grow into Sr. specialists and then into managerial positions. Creates communications programs that effectively describe and promote the organization and its products including graphics, brochures, company or product fact sheets, logos, or other promotional products. Researches and develops content for publication of products. Prepares presentations and/or speeches geared towards employees. Requires a bachelor’s degree in area of specialty and 2-4 years of experience in the field or in a related area. Familiar with a variety of the field’s concepts, practices, and procedures. Relies on experience and judgment to plan and accomplish goals. Performs a variety of tasks. A certain degree of creativity and latitude is expected. Typically reports to a supervisor or manager. Collects and analyzes data to evaluate existing and potential online markets. Uses traffic tracking applications to recognize user patterns and trends to help formulate effective marketing techniques. Requires a bachelor’s degree in area of specialty and 2-4 years of experience in the field or in a related area. Familiar with standard concepts, practices, and procedures within a particular field. Relies on experience and judgment to plan and accomplish goals. Performs a variety of tasks. Works under general supervision. A certain degree of creativity and latitude is required. Typically reports to a supervisor or manager. Responsible for designing, creating, and delivering marketing programs to support the growth and expansion of company products and services. Develops sales presentations and provides reports based on information collected such as marketing trends, competition, new products, and pricing. Requires a bachelor’s degree in area of specialty and 2-4 years of experience in the field or in a related area. Familiar with a variety of the field’s concepts, practices, and procedures. Relies on experience and judgment to plan and accomplish goals. Performs a variety of tasks. A wide degree of creativity and latitude is expected. Typically reports to a supervisor or manager. Collects and analyzes data to evaluate existing and potential product/service markets. Identifies and monitors competitors and researches market conditions or changes in the industry that may affect sales. Requires a bachelor’s degree, and 0-2 years of experience in the field or in a related area. Has knowledge of commonly-used concepts, practices, and procedures within a particular field. Relies on instructions and pre-established guidelines to perform the functions of the job. Works under immediate supervision. Primary job functions do not typically require exercising independent judgment. Typically reports to a supervisor or manager. Prepares and disseminates information regarding an organization through newspapers, periodicals, television, radio and other forms of media. Helps maintain a favorable public image for the organization. May require a bachelor’s degree in a related area and 0-2 years of experience in the field or in a related area. Has knowledge of commonly-used concepts, practices, and procedures within a particular field. Relies on instructions and pre-established guidelines to perform the functions of the job. Primary job functions do not typically require exercising independent judgment. Works under immediate supervision. Typically reports to a supervisor or manager. Responsible for placing, confirming and monitoring media orders. May assist in research for the development of the media plan. This is primarily an administrative role. May require a bachelor’s/associate’s degree in area of specialty and 0-2 years of experience in the field or in a related area. Has knowledge of commonly-used concepts, practices, and procedures within a particular field. Relies on instructions and pre-established guidelines to perform the functions of the job. Works under immediate supervision. Typically reports to a supervisor. Uses knowledge of current graphic design software to produce graphic art and visual materials for promotions, advertisements, films, packaging, and informative and instructional material through a variety of media outlets such as websites and CD-ROMs. Generates and manipulates graphic images, animations, sound, text and video into consolidated and seamless multimedia programs. Must remain abreast of technological advances in the field and be able to identify areas of use in the organization. May require a bachelor’s degree or its equivalent and 2-4 years of experience in the field or in a related area. Familiar with standard concepts, practices, and procedures within a particular field. Relies on limited experience and judgment to plan and accomplish goals. Performs a variety of tasks. Works under general supervision; typically reports to a supervisor or manager. A great deal of creativity and latitude is expected. Coordinates and implements marketing communication projects with responsibilities that include public relations, special events management, advertising, and creating brand awareness. Organizes the preparation of proposals and presentations using marketing resource materials such as brochures, data, slides, photographs, and reports. Prepare status reports on marketing efforts. May require a bachelor’s degree in area of specialty and 0-2 years of experience in the field or in a related area. Familiar with standard concepts, practices, and procedures within a particular field. Relies on limited experience and judgment to plan and accomplish goals. Performs a variety of tasks. Works under general supervision. A certain degree of creativity and latitude is required. Typically reports to a supervisor or manager. Coordinates and administers sales promotions in order to advertise a product and to maximize the profits of the organization’s sales. Assists in researching, evaluating and recommending enhancements to the market positioning of the organization’s products or services. May require a bachelor’s degree and 2-4 years of experience in the field. Familiar with a variety of the field’s concepts, practices, and procedures. Relies on experience and judgment to plan and accomplish goals. Performs a variety of tasks. Leads and directs the work of others. A wide degree of creativity and latitude is expected. Typically reports to a supervisor or manager. Writes, proofreads and edits copy brochures, print and other documents. May assist in estimating production costs, overseeing work done by external suppliers, and preparing the marketing program. May require a bachelor’s degree in a related area and 0-2 years of experience in the field or in a related area. Has knowledge of commonly-used concepts, practices, and procedures within a particular field. Relies on instructions and pre-established guidelines to perform the functions of the job. Works under immediate supervision. Primary job functions do not typically require exercising independent judgment. Typically reports to a supervisor or manager. Prepares marketing strategies and programs for a product or product line. Evaluates product performance to help develop and update company goals and objectives. Advises sales team on any relevant product concerns. Recommends changes to current product development procedures based on market research and new trends. May require a bachelor’s degree in area of specialty and 0-3 years of experience in the field or in a related area. Has knowledge of commonly-used concepts, practices, and procedures within a particular field. Relies on instructions and pre-established guidelines to perform the functions of the job. Works under immediate supervision. Typically reports to a supervisor. Responsible for pricing of goods and services in order to stay competitive in the market. Conducts market research and makes recommendations regarding pricing policies. Maintains historical pricing data on the organization and its competitors. Requires a bachelor’s degree in area of specialty and at least 2-4 years of experience in the field or in a related area. Familiar with a variety of the field’s concepts, practices, and procedures. Relies on experience and judgment to plan and accomplish goals. Performs a variety of tasks. A certain degree of creativity and latitude is expected. Typically reports to a manager. Responsible for negotiating, scheduling, and buying appropriate media. Must identify target audience and ensure media reaches target audience. Works closely with media planner to implement media plan. May require a bachelor’s degree and 2-4 years of experience in the field or in a related area. Familiar with standard concepts, practices, and procedures within a particular field. Relies on experience and judgment to plan and accomplish goals. Performs a variety of tasks. Works under general supervision. A certain degree of creativity and latitude is required. Typically reports to a supervisor. Responsible for purchasing and negotiating materials, equipment, and supplies from vendors. Evaluates vendor quotes and services to determine most desirable suppliers. May require a bachelor’s degree and 0-3 years of experience in the field or in a related area. Has knowledge of commonly-used concepts, practices, and procedures within a particular field. Relies on instructions and pre-established guidelines to perform the functions of the job. Works under immediate supervision. Primary job functions do not typically require exercising independent judgment. Typically reports to a supervisor or manager. 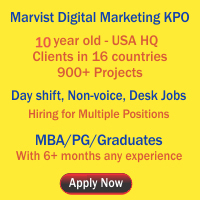 This entry was posted on Jul 2012 at 5:15 PM	and is filed under Marketing Jobs in Hyderabad > MBA Marketing Jobs > SEO Jobs. You can follow any responses to this entry through the RSS 2.0 feed. Your Feedback Matters!